Prepare for your next adventure by taking LAS 203X! 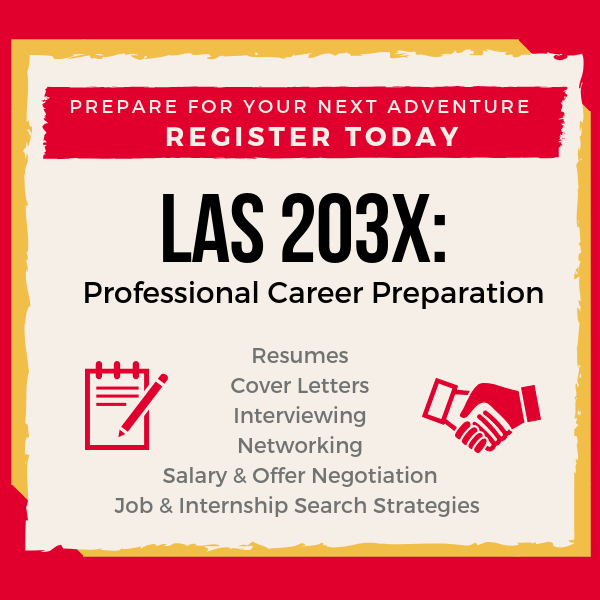 LAS 203X is a one credit, 8 week course designed to provide students with knowledge on foundational career-related topics such as resume writing, interviewing, negotiating offers, and other career related topics. Students will develop effective strategies for overall professionalism and internship/job seeking methods to positively impact future career success. What topics will LAS 203X discuss? Who can take LAS 203X? This course is open to students in the College of Liberal Arts & Sciences who are sophomores and above. Register in AccessPlus! When is LAS 203X offered? *Courses meet for only half the semester. Open to Liberal Arts & Sciences students, sophomore and above. What do students say about LAS 203X? Angela Wagner is the course instructor and career education coordinator in LAS Career Services. She started instructing career preparation classes at Iowa State University over three years ago. Angela is also an ISU alum with a Bachelor of Science degree in Marketing (May 12’) and a Master of Education degree in Higher Education (Dec. 18’). Her passion for career services began during her graduate assistantship in the LAS Career Services office during 2014. She has a sincere passion for inspiring students and helping them achieve their future career goals.